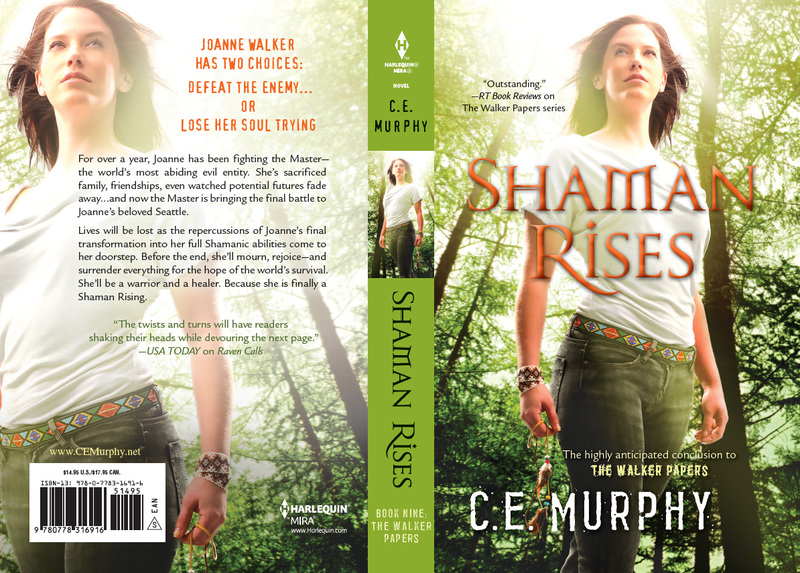 I thought I’d start the new year off right, with a cover reveal for SHAMAN RISES, the final book of the Walker Papers! Would you like to know all the reasons this cover is terrific? Let me tell you all the reasons it’s perfect! First: the colors. My publisher’s always been very good about discussing colors with me, and I very much wanted the final book in the series to have a light, bright look in direct and deliberate contrast to the first book’s cover. So what do I get? Spring green and whites: *perfect*, and also well in keeping with the time frame for the book, which is set in early April. Second: Joanne’s pose. It’s *perfect*. It’s strong. It’s confident. It’s relaxed. It’s looking upward and outward, challenging without being afraid. It is, again, the *perfect* contrast to the dark, clench-fisted tension of the first cover. Third: JOANNE HAS A FACE! Okay, granted, the face looks absolutely nothing like Joanne (and we won’t even talk about the hair!) but we actually finally get to fully see her, and it’s as a grown-up, confident woman, which actually–although I know perfectly well this was not the intention of the cover department; it’s just been the evolution of urban fantasy covers over the past eight years–really works beautifully well in terms of slow reveals. I’m just delighted with it! I had many similar thoughts, including "She has a head! She has a face! But . . . she really doesn't look anything like Jo, does she? Hnnng. My first reaction is 'wow' - how different and striking compared to so many of the urban fantasy covers. Totally thought wow - she has a face and it's so light! Like everyone else, my first reaction was "she has a face!" :) Followed by "Kit must be so pleased!" It's a gorgeous cover. I'll echo everyone. "She has a face!" I'm mostly just glad you're happy with it. I'm still waiting on pins and needles to see what my first novel's cover looks like. This cover makes me take a deep breath, and that's good. * It also seems to me to fit the title, especially the looking up/out and into the light. Like she's ascending into a higher level of...something. As much as I hate 'me too!' posts, me too. I was amazed that she has a face finally, and I really like the cover. Yay! Yay face! The cover looks awesome!